This issue features two pictures with animals from the spectacular reefs of San Salvador, The Bahamas. This reef scene shows a Giant Anemone on the inner reef, inshore from the coral barrier wall near San Salvador. 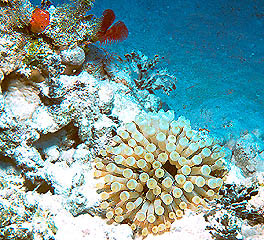 Click here for more info, and to learn why there aren't more corals on this reef. 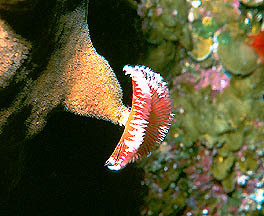 Split-Crown Feather Duster Worms live on both the inner and outer reefs. Click here for more info, and to learn why this reef has so much coral.